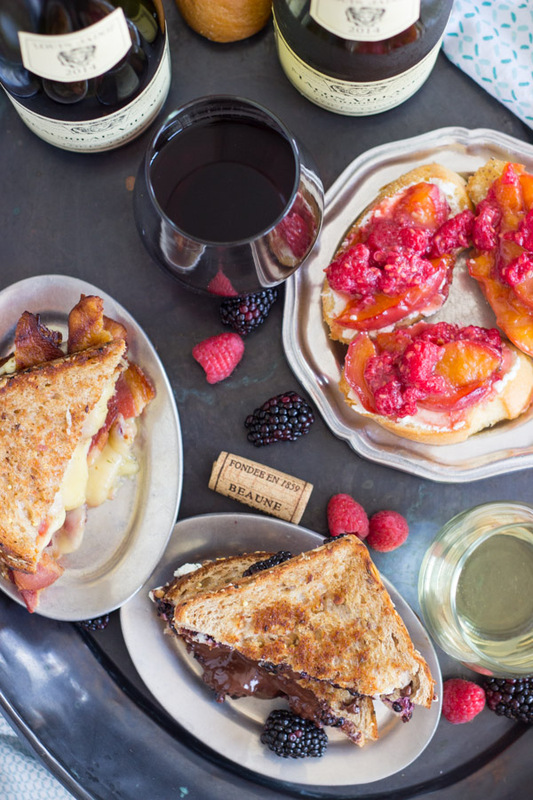 Adult Grilled Cheese: 3 Ways. This post was sponsored on behalf of Maison Louis Jadot Wines via One2One Network. All opinions stated are my own. Two summers ago, I got really into learning about wine. It came out of nowhere, but I was suddenly fascinated. I always liked drinking it, but I didn’t feel an urge to understand more about the wine regions of the world or the varietals, except to know that I like a wine if it was red. Almost any type of red. And the occasional white, but red was really my jam. But I had a quick onset of wine curiosity, and I started reading a few popular wine books so that I had at least a basic understanding of fermented grapes. I even convinced my S.O. to attend a few wine education classes with me at a local wine shop. My birthday was coming up, so I had bargaining power. It was seriously fun. First of all, it was hilarious because the teacher actually used an overhead projector with transparencies. When is the last time you saw one of those? Obviously, the tastings were a highlight of the classes, but the education was all interesting too. Wine is so much more complex than I ever realized, and I really enjoy learning about it. In addition to the classes, I kept reading wine books voraciously all summer, and I keep a few of my favorite books on hand as a reference. We have several excellent local wine stores here in Tampa, and sometimes I pop in just to wander around. All of this to say, I’d never heard of Beaujolais until I started reading about wine a few summers ago, but once I tried it, it quickly became a favorite summer red. It was recommended to me as a lightweight and juicy red. It’s not a heavy red. It’s light, simple, and fruity. It’s particularly great for summertime because it’s more refreshing than a bold or heavy red, like Cabernet. I love me some Cab and bolder reds, but not necessarily in the heat of summer. So Beaujolais sounded like the perfect red wine for summertime, and it is. It’s a really nice everyday, drinkable red that pairs well with almost any food. 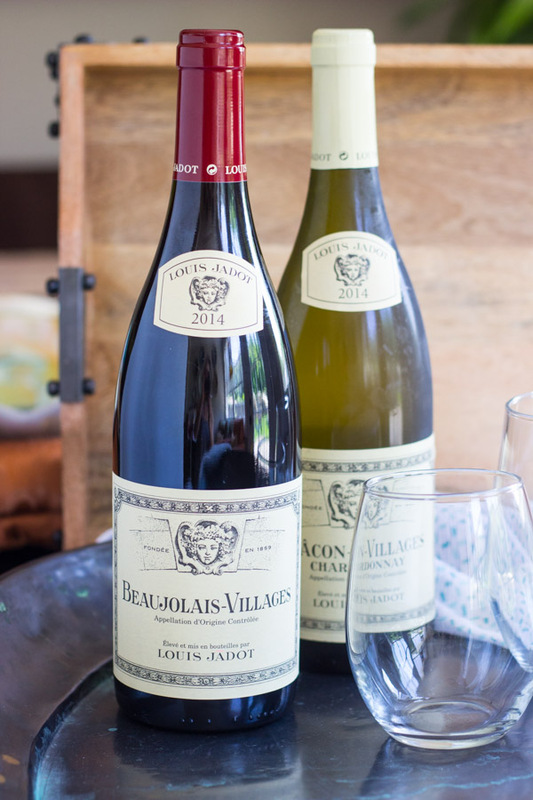 The Louis Jadot Beaujolais-Villages is one of my favorites. 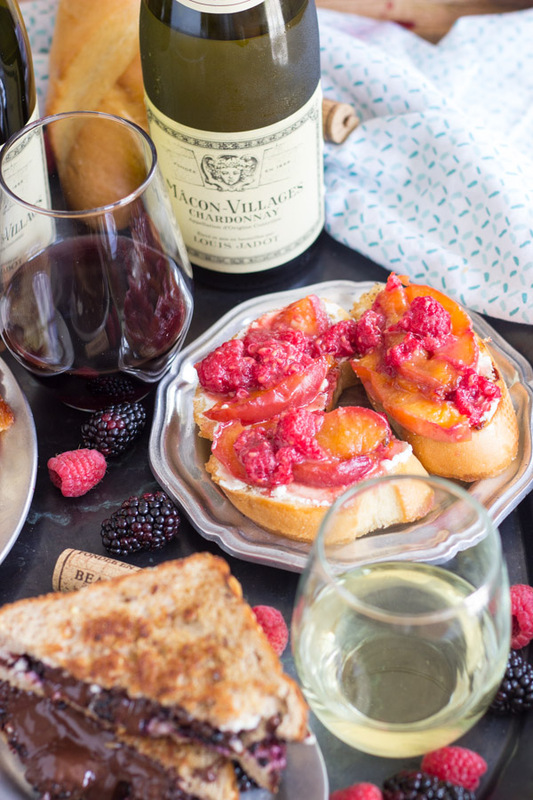 I wanted to share a few ideas for summer wine pairings with the Beaujolais-Villages, but also the Louis Jadot Chardonnay! My first idea, of course, was a cheese plate, but I feel like you’ve probably seen your fair share of those already. 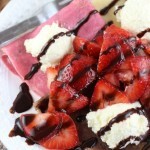 I kept brainstorming for ideas, and I still wanted to incorporate the usual suspects of cheese, bread, meats, and fruit. 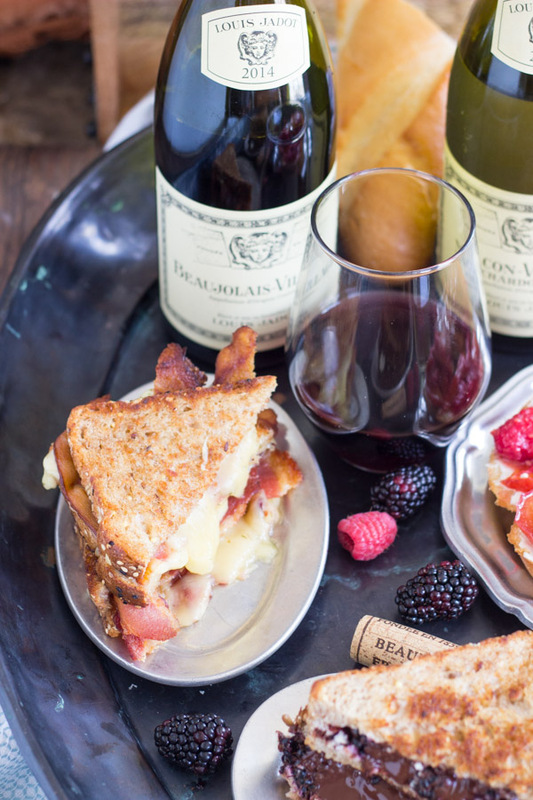 Those are such classic foods to pair with wine. Somehow I landed on grilled cheese sandwiches, but gourmet grilled cheese, and three ways. Three different options for adult, gourmet grilled cheese. One savory, and two sweet. All of them pair really nice with Beaujolais, because it pairs with just about anything. And if you’re a white wine person, these are all really nice fits for Chardonnay too. 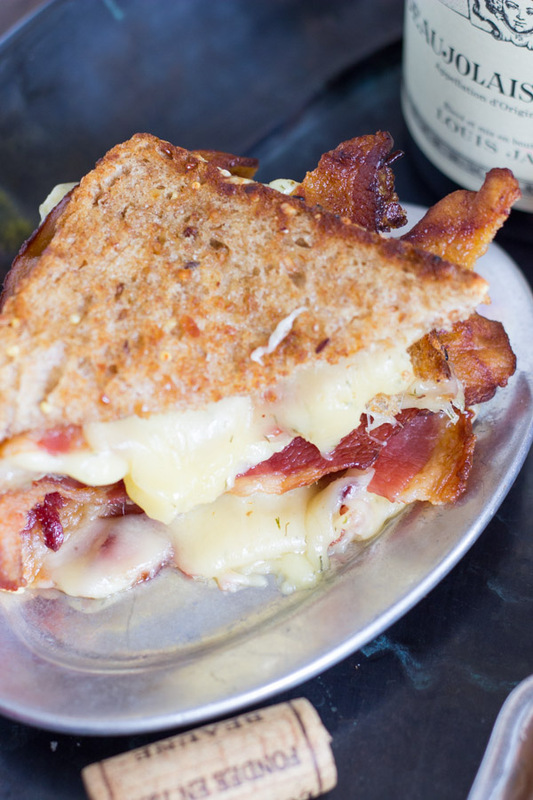 The savory sandwich is one of the best food combinations of life – bacon and Havarti dill. Together, they are gold. 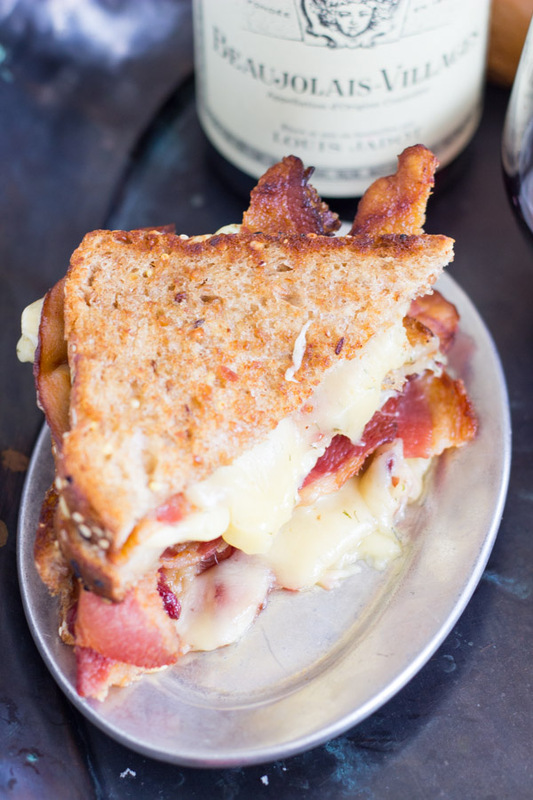 Fried bacon and melted havarti on bacon-grease toasted multi-grain bread = dynamite. 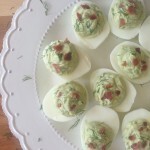 The dill with the saltiness and the smokiness of the bacon is perfection. Sometimes I just wrap a hunk of Havarti dill with bacon and make it a snack. You could do that too. Super simple to prep the grilled cheese though! Spread each slice of bread with a light layer of bacon grease. Prepare 4 sandwiches with 2-3 slices of bacon, and 2-3 slices of Havarti dill. In a large skillet over medium heat, grill each sandwich til golden brown on each side, and til the cheese is melted, about 2-3 minutes each side. Cut in halves. Serve immediately. Yield: 4 sandwiches. 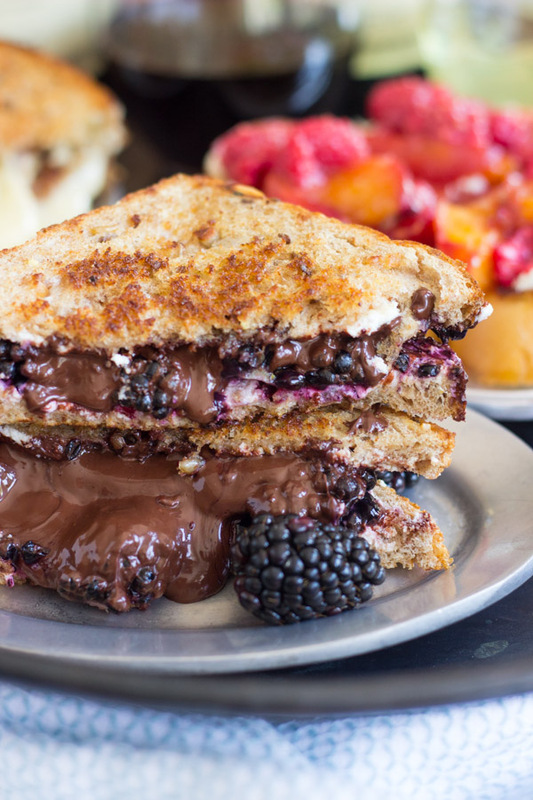 The first sweet option is fresh, tart blackberries that burst and ooze, with creamy Mascarpone cheese, and gooey, melted dark chocolate on buttered, toasted multi-grain bread. You could use brioche though? 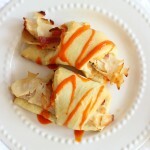 This sandwich is really nice with the acidity and citrus of the Chardonnay. Spread each slice of bread with a light layer of butter. Prepare 4 sandwiches by spreading one side of one piece of bread with about 2 oz. 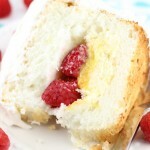 Mascarpone cheese, and topping with blackberries, 2 oz. 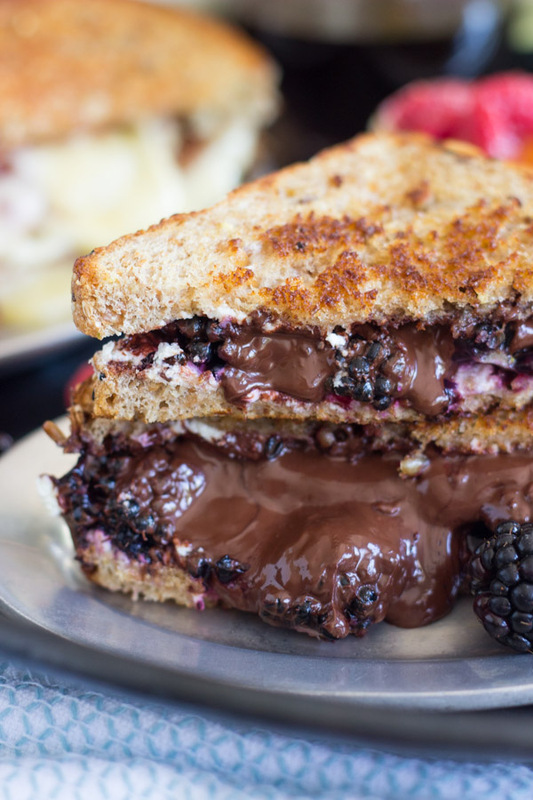 chocolate, and the other slice of bread. In a large skillet over medium heat, grill each sandwich til golden brown on each side, and til the chocolate is melted, about 2-3 minutes each side. Finally, an ‘open-faced’ grilled cheese, aka, let’s call it what it is, crostini! 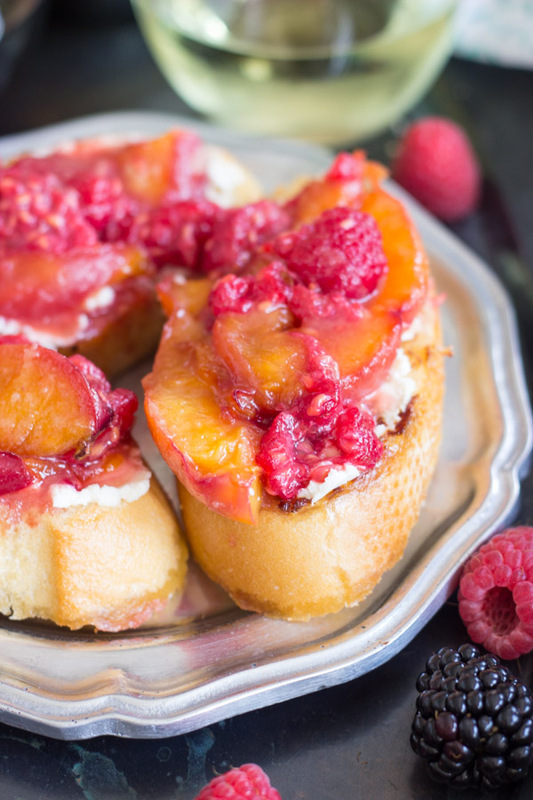 Crusty French bread, cut into slices and toasted with butter, topped with honey goat cheese, caramelized peaches, and smashed raspberries. Spread each side of the baguette slices with a light layer of butter. 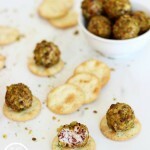 Spread each slice with about a tablespoon of goat cheese. In a small saucepan over medium heat, saute the peaches, 2 tbsp. butter, and 2 tbsp. brown sugar until peaches are golden, soft, and caramelized, about 4-5 minutes. Add raspberries, smashing lightly. Remove from heat immediately. 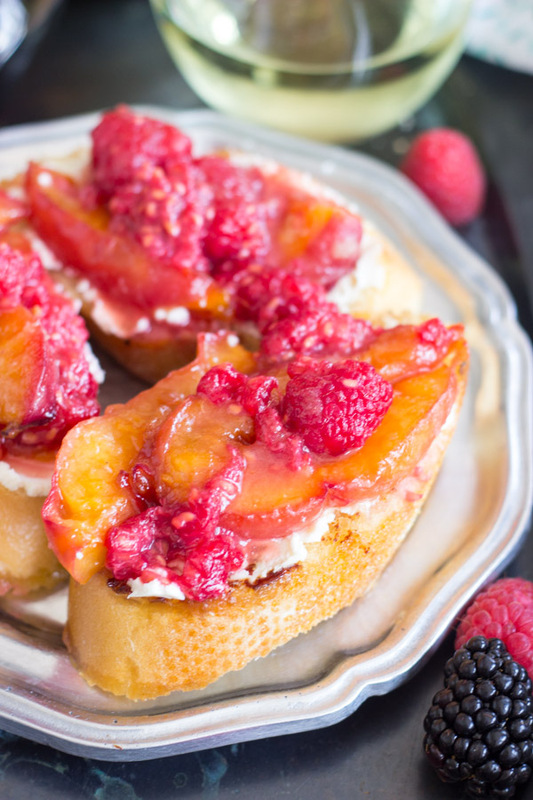 Top the crostini with a spoonful of raspberry-peach sauce. Serve immediately. Yield: about 8 crostini. 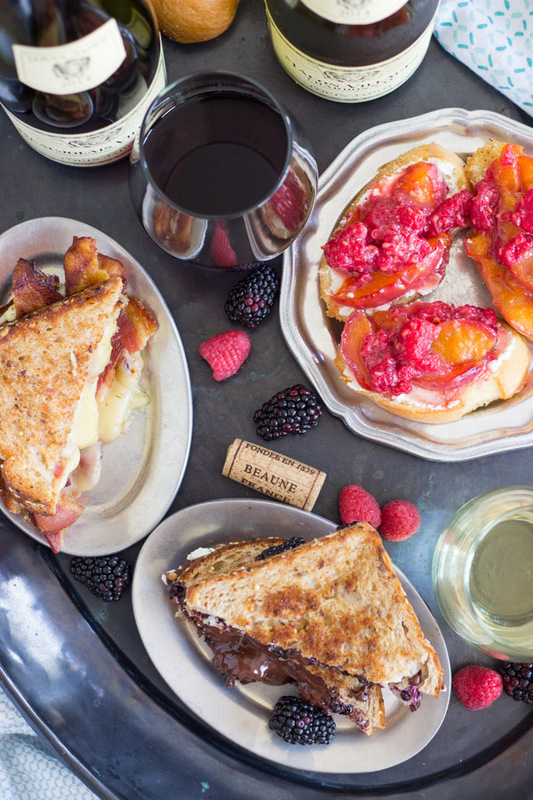 Grilled cheese doesn’t have to be a wintertime comfort food, it can also have a summery twist. 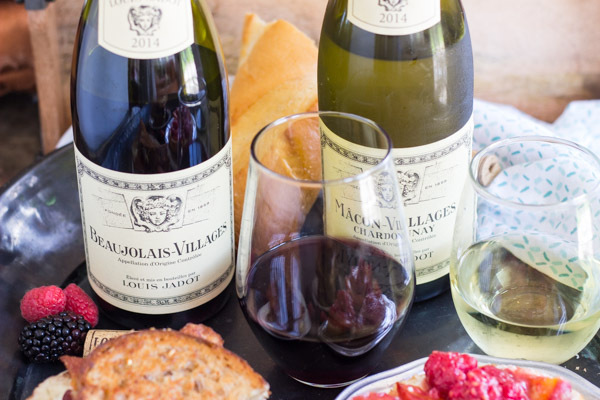 These are three delicious options that are delightful for pairing with refreshing and drinkable summer wines, like the Louis Jadot Beaujolais-Villages and Chardonnay!